It was not my first time to visit China, I've been to Shanghai a few year ago with my family for vacation, so for my Beijing trip, I once again applied for a Chinese Tourist Visa. If you are a Filipino and are planning to visit the land of the dragon you must first acquire a Chinese Visa. The good thing about Chinese Visa is that once you already had an existing visa applying for another one wouldn't be as difficult as the first time. 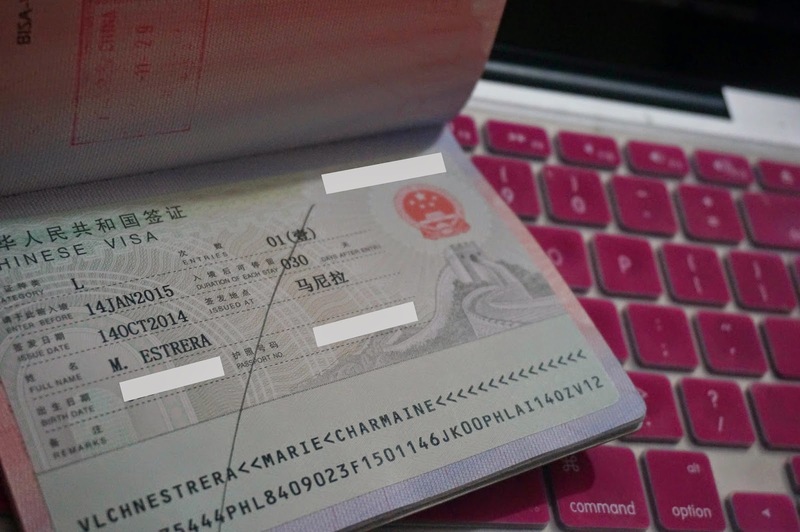 Here are the steps in acquiring a Chinese tourist visa for Philippine passport holders. Leave at least two blank pages and it should be valid for 6 months from date of entry. You can download it HERE. Remember not to leave any blank spaces and put N/A (not applicable) when needed. Do not forget to sign at the bottom. These requirements are proof that you are going back to your country of origin. f) Hotel Voucher/Reservation or Invitation letter with a copy of the inviter's Chinese residence visa and passport information page. Try to research on where you want to go during your trip and make a general outline for your itinerary. Attached HERE is the sample itinerary I passed. Don't forget to tell your HR to include the date of issue and company's contact number/s & address. Personal Bank Statements updated within (3) three months before the date of application, time deposit certificate or original land title, car registration (original and photocopy). They need this just to make sure that you are financially capable of supporting yourself while you're in their country. However there is no specific monetary basis to get approved. If you want to know, the first time I applied for a visa I passed an amount of Php100,000.00. Please take note that other requirements maybe required by the consul. Like for us, TV Producers/Media Practitioners the consul required a letter from my immediate superior stating that my trip to China is for leisure purpose only. Process your visa early so you will only pay a minimum amount. Appearance is generally not needed so I submitted my requirements and fees to the travel agency in our office so it would be less stressful on my part plus agencies know better, they will guide you on the requirements needed by the consulate. If you apply through travel agency a service fee with vat will be asked from you. We were asked an amount of P560 per passport. You can pass the requirements directly at the Chinese Embassy but take note on their national holidays as they are close during those days. Hello Cham, thanks for the very helpful advice. I'm just wondering what is the difference between a single and double entry visa? Hi Marc! Single entry visa allows visitors to visit China only 1 time while the double entry allows visitors to visit 2 times. I applied for a single entry for four days processing as I don't have any plans to visit the country twice in a span of two months. Thanks for the blog. Indeed this is very helpful to every Filipino traveller wanting to visit China. Can I know which travel agency it was that you used? Or do you have any recommendation for travelling to Beijing? My in laws are both US passport holders but we have no idea how to get a Chinese visa so a travel agency processing things would be very helpful. Hi Just submitted and paid Jeron Travel for Taiwan Visa application. Just wonering they did not get old passports bearing previous travels and stamps. Agent said TECO does not look after travels but previous Taiwan visas issued only. Is this same and true with your experience also? we applied as family and just worried because our yearly out of the country travels could also be an advantage for our application right? well I know they are the experts on this matter but just asking :) Thanks ! Hi there, based on my experience with applying a Taiwan visa yes we didn't give any visa or stamp from previous passports that's because I don't have an old passport that time :) Jeron travel is very close with TECO so I'm quite sure they know pretty well of the process :) excited for you to travel to Taiwan. Did u present upon visa application arline ticket/ reservation? Or your itinerary is as good as what they require? What if I just recently resigned and still did not have my COE and ITR since I havent completed yet my exit clearance but I have a newly registered business, DTI/ COR and Mayors Permit. I am planning to give my 2015 ITR though and explanation letter?